This pretty little indoor plant adds a distinctive touch to your home decor. The variety of fittonia is also known as Pink Angel. and is a distinctive plant with dark green leaves which have brightly colored pink veins. Growing Fittonia Albivenis is very easy for beginners, since it doesn’t mind low light. Where does fittonia albivenis grow naturally? The plant is a native of Peru. The deeply veined leaves of fittonia albivenis have a trailing habit, which lets them spill over the edges of a pot or basket container. Since this is a tropical plant and only hardy to zone 11, it is grown in most areas as a houseplant. This pretty plant is known by several common names. The most common one is nerve plant and one only has to look at the leaves of the plant to see why. The veins look amazingly like nerves. Also if you look at a pair of the leaves, you can see where the name Pink Angel comes from. Two other common names for the plant are Mosaic plant and Painted Net Leaf. This lovely plant is relatively easy to grow. The main consideration for keeping it healthy is to manage the humidity. In order to keep it in good condition, here are some tips for growing Fittonia Pink Angel. Nerve plant grows best in low to medium light, though it also thrives in a sunny window if the light is filtered with a sheer curtain. If it gets too much hot sun, even indoors, the leaves may burn, turning brown and crispy. If you have a North facing window, this is an ideal spot for the plant, since it will get far less light here but it will still be a bright spot. Pink Angel fittonia enjoys even moisture. I like to water my plant when the surface of the soil just starts to dry out. Insert a finger into the soil and if it is dry to about the first knuckle, give it a drink. Don’t over water, though, since the plant does not like wet and soggy soil. 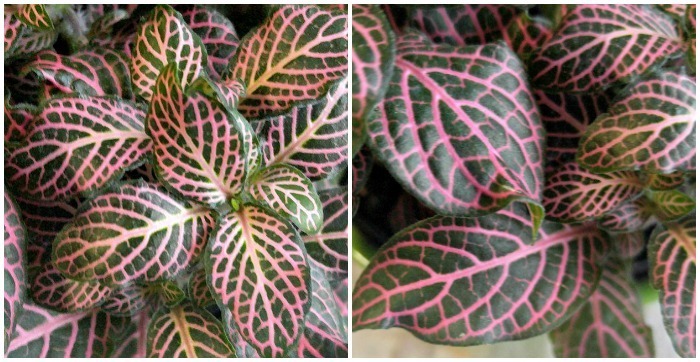 The leaves of fittonia albivenis are green with deep veins that are colored pink. The underside of the leaves are a lighter green color. Mature leaves of fittonia have a deeper pink color to the veins, but newer growth is lighter in color with a whitish pink color. The plant does have blooms when it gets just the right conditions but is grown more for the leaves than for the flowers. The blooms are rather insignificant and can be both reddish or white. They have the shape of spikes and their color makes them blend in with the foliage. It is rare to see a fittonia grown as a houseplant in bloom. The size of the plant can grow to 12-18 inches or larger. Like many tropical houseplants, the nerve plant loves humidity. It will benefit from a weekly spray with a plant mister. It is also the perfect choice for growing in terrariums where the level of humidity is naturally high. 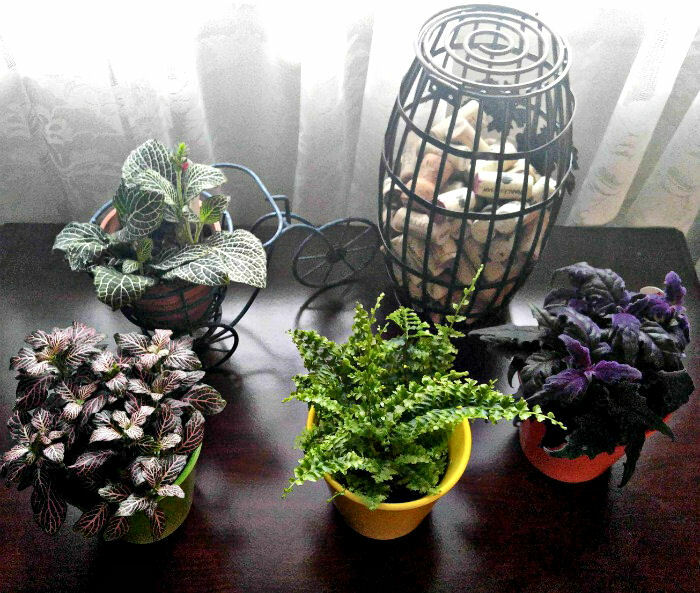 Be sure that the temperature of the room where you are growing fittonia albivenis is kept around 60 º F or higher. This means keeping it away from drafty windows when the temperatures outside are cold. The plant likes it best around 70 degrees and will not do well in rooms that are hotter than 80 degrees. 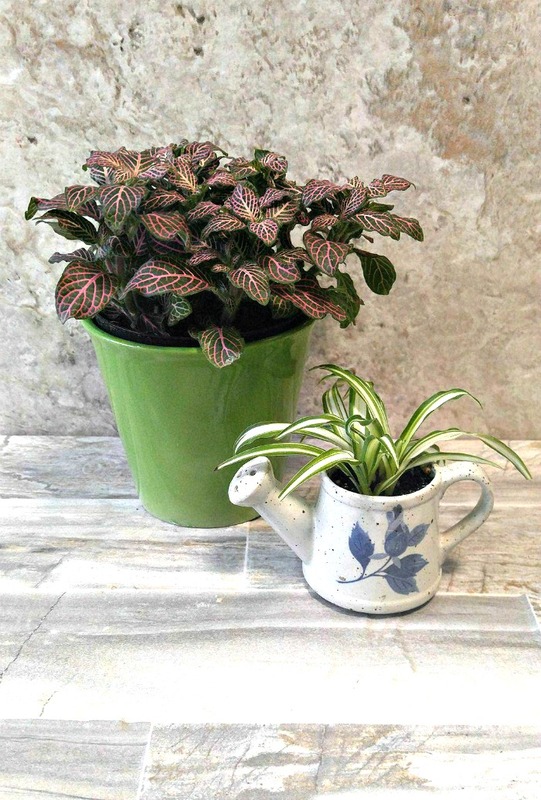 The winter months are a slow growing time for most houseplants, so hold off on fertilizing at this time. This plant add a pretty decorative touch to any spot where you place it indoors. It looks pretty in hanging baskets, makes a nice table plant and also is the prefect choice for terrariums. 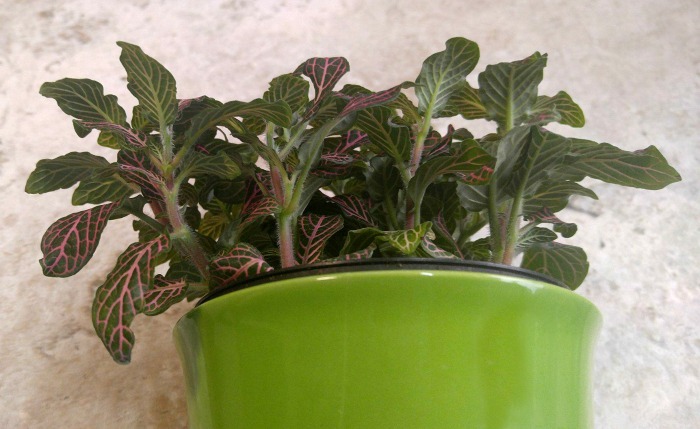 Grow this pink variegated variety of fittonia in plant pots that showcase the color of the leaves. I chose a neon green outer pot that highlights the under side of the leaves but it would also look really pretty in a bright pink pot. All forms of the plant like similar growing conditions. For a larger variety of the plant, try growing fittonia gigantea, which can grow to 24 inches and has purple stems with dark green leaves and deep red veins. 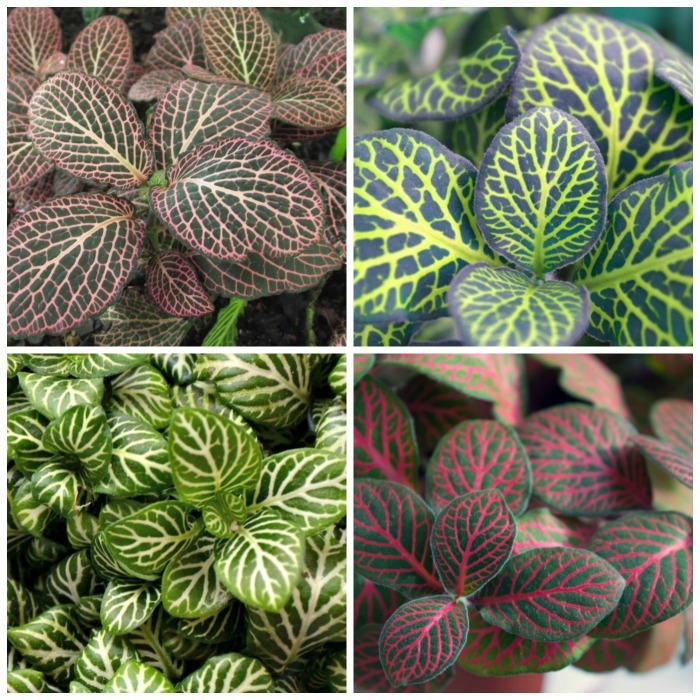 There is quite a bit of variation in the veins and leaf colors of fittonia plants from pure white to deep crimson. Get more plants for free by taking stem cuttings of pink angel fittonia. Dip the ends of the stems in a rooting powder and insert them in a well draining seed starting medium. When the stems have developed roots, transfer to normal potting soil. Cuttings are best done in late spring or early summer when the growing season is at its prime. Growing fittonia albivenis is generally quite easy. As long as you don’t over water the plant or let it dry out, it does fairly well. One pest that seems to find it attractive is the mealy bug, which loves the plants soft stems and leaves. If you are looking for a pretty table plant or perfect terrarium plant, try growing Fittonia Pink Angel. You’ll be glad you did! 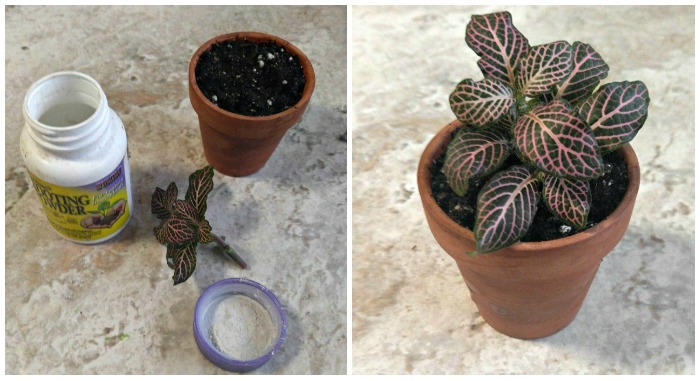 Would you like a reminder of these tips for growing fittonia albivenis? Just pin this image to one of your gardening boards on Pinterest so that you can easily find it later. Admin note: This post first appeared on the blog in February of 2018. I have updated the post to add new photos, a printable care card and a video for you to enjoy. 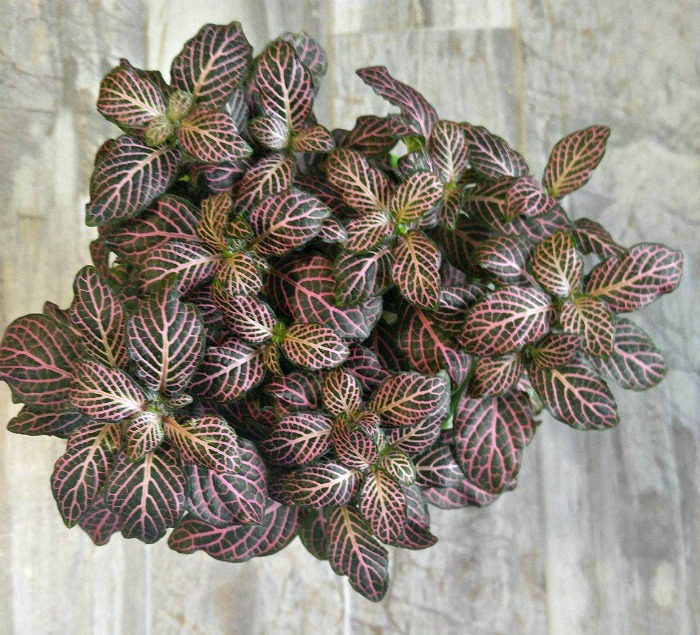 This variety of fittonia is also known as Pink Angel. and is a distinctive plant with dark green leaves which have brightly colored pink veins. Growing Fittonia Albivenis is very easy for beginners, since it doesn't mind low light. Sunlight: Bright filtered light. A North facing window is best. Watering: Add more water when the soil is dry about 1 inch down. Soil: Well draining potting soil. Humidity: The pant needs humidity. Place on a pebble tray with water or mist weekly. Temperature: Keep at 60 degrees F or higher. Fertilizing: Fertilize monthly during the growing season. Hold off in the winter when the plant is more dormant. Propagation: Stem cuttings (under a plastic dome is best for humidity needs) Rooting powder helps to promote root growth. Hello! I have what seems to be an oddly growing Nerve Plant. I bought it last spring (over a year ago) and almost killed it due to overwatering and too much sunlight. So I moved it and have cut back on watering. It’s growing tall, but has so few leaves! Should I trim and propagate it into the same planter to get more of a full looking plant? Thanks for your help! I have a pink angel plant that I have over watered, is there anything I can do to help it survive? My little plant seems to be doing pretty good, but I was wondering about propagating so I can have more. I am not sure where to cut, and if I pop it in a glass of water, is it ok to switch to pot once it gets roots? I have read I am not supposed to go from water to soil with some plants, but I don’t want to have to keep them in water forever. The one I have has some blooms on it too. when i put my cuttings in soil, they almost immediately went limp. I cut them and removed any leaves, dipped in rooting powder, and made sure the soil was damp. Am I doing something wrong?